The Girl to Gorilla Illusion was one of the top-grossing grind shows on the carnival midway. Sadly, there are few if any working today. If you know of one, let us know! The last G2G that we saw was Jack Constantine’s and it was quite a few years ago. 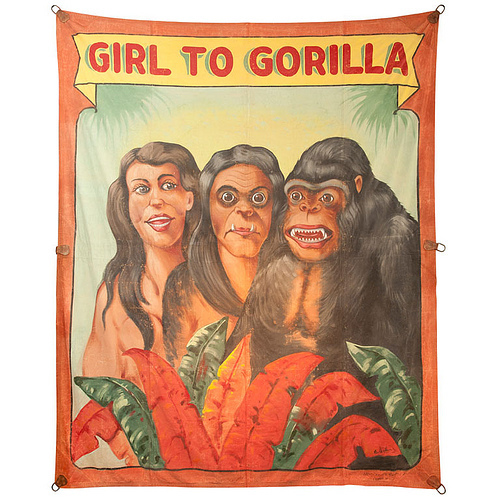 This vintage Girl to Gorilla banner signed by master banner painter Fred Johnson is being offered for sale by Toronto’s Hideaway Antiques. It gives an impressionistic idea of what to expect on the inside. As the talker on a vintage clip of Harvey Fillmore’s Princess Uraana show posted by YouTube user ZAMBORA57 says, “You’re going to see a beautiful girl change before your eyes very slowly into an ugly male gorilla…From the top of her head to the tips of her toes you’ll see the hair grow. The Ape Girl. The Ape Girl. The Ape Girl. Anything can happen…” The illusion is done with mirrors but when the “gorilla” breaks out of the steel cage, the screaming audience runs out of the tent, attracting a crowd for the next show. The show in the video cost only 75 cents! I saw the same type of act around 1970 when the James Strates shows Carnival came to Delaware on its yearly visit. When the girl turned into a Gorilla and ran into the audience, everybody screamed and ran out of the tent. It was one of the best tricks I’ve ever seen at a carnival. When I was just young lad of 19 I toured with the “Gabora the Gorilla Girl” show, run by Tim Deremer and Fred Haydn. It was a blast! I played the gorilla, and I tell people my job was to induce riots of small groups of people. My little brother was so scared, he didn’t run out the approved exit/entrance; he went out by climbing UNDER the side of the tent! LOL! Here in Brazil, exactly in Campo Maior, Piaui, 2 days ago I came across a town carnival and saw the MONGA act. It consisted ofthe same performance, a girl becomes in a beast. I have a picture of the venue. There will be a Girl to Gorilla performed before the Thursday evening show (in a tent) at the 79th Abbott Get Together on August 4th 2016 in Colon Michigan.